Champagne Horror - ZineWiki - the history and culture of zines, independent media and the small press. 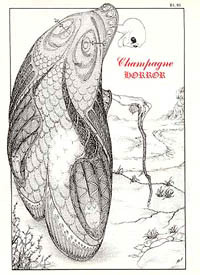 Champagne Horror is a small press publication by Cathy Buburuz. Only one issue of Champagne Horror was released in Regina Saskatchewan, Canada, in 1990. It featured fiction, poetry, illustrations, demented nursery rhymes, and a cartoon, all devoted to horror, weird fiction, and the supernatural. The Art Editor was Randy Nakoneshmy. Champagne Horror was a 60 page international anthology featuring artists and writers from Austria, Canada, Germany, Hungary, Italy, Japan, the U.S.A. and Yugoslavia. The demented nursery rhymes are by Jeanette M. Hopper, Jay Littlehorn, Marge B. Simon (Star*Line), Tao Rae Tasmaine, and Ree Young. Fiction is by Cliff Burns, Larry G. Cardiff, Alan Catlin, R.C. Correll, Robert G. Howard, Diana Kemp-Jones, Michael J. Lotus (Nocturne), Michael G. McPherson, R.J. Michaelz, John-Ivan Palmer, Holli Bardo Quinn, and Tao Rae Tasmaine. Poetry is by Cliff Burns, Alan Catlin, William I. Elliot, Justice Howard, Janet P. Reedman, William P. Robertson, and Tao Rae Tasmaine. The cover is by Horvath Akos. Interior illustrations are by Horvath Akos, Kurt Cagle, Charles Dougherty, Jakob Klemenic, Allen Koszowski, Bernardini Mario, Lana Michelin, Bucky Montgomery, Norm Scheelhaase, Marge B. Simon, David L. Transue, Klaudia Weber, and Ree Young. The cartoon is by Kevin Duncan and Al Manachino. Photography is by Justice Howard. In 2005, Cathy Buburuz began publishing the e-zine Champagne Shivers yearly. 5 issues appeared, the last in 2009. This page was last modified on 15 April 2018, at 13:47.